The Revolt of Masaniello is more of an interesting sidelight than a pivotal chapter in the history of Naples. That is, this brief rebellion by the people—les miserables—of Naples against the Spanish rulers of the city in 1647 is now solidly entrenched in Neapolitan folklore. It has heroism, treachery, deceit, murder, success and defeat, all the elements of a good tale. 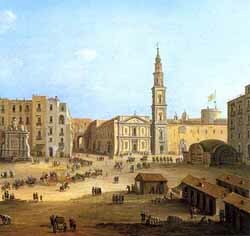 Tommaso Anielo (nicknamed "Masaniello") (1620-1647) was an illiterate fishmonger living and working in the area of Piazza Mercato (Market Square). That part of the city was, at the time, much more central to the everyday affairs of Naples than it is today. The rebuilding of Naples in the late 1800s and early 1900s separated the old Market Square from the new "downtown" and removed the market place from the vital position it had held for centuries. It was not simply a market place. It was the site of the popular Church of the Carmine; it was a venue for folk festivals; it was the scene of historic events such as the execution of the Swabian pretender, Conradin; it had a gallows and various instruments of torture set up in the square and all used in the 1600s; the king's soldiers thronged the square; it was filthy, loud, crowded, colorful, busy and, very important, here was where you went to pay your taxes. Straight folklore simply says that when the news broke in Piazza Mercato (painting, left) that the Spanish had levied yet another tax on fruit, Masaniello, in charge of the mock army fighting the mock Turks in the festival, was outraged and through the power of his Robin Hood-type charisma transformed his make-believe army into a real one and marched on the palace to wring justice from the evil overlord, the Spanish viceroy. 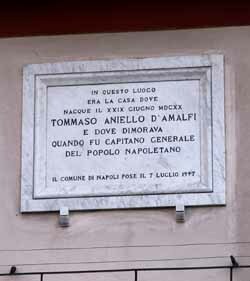 There is some evidence that Masaniello, however, had been contacted by one Don Giulio Genoino, an elderly priest who had tried and failed 20 years earlier to get some redress from the viceroy and had actually spent time in prison for his efforts. Genoino may have been the puppet master pulling Masaniello's strings —the brains behind the revolt. In any event, on Sunday morning, July 7, 1647, Masaniello's ragtag army, with him and his cousin at the head, spilled out of the festival —out of the world of make-believe— and into the very real tax-collection stalls of the market place and the battle was on. Their cry is said to have been, "Long live the King! Down with bad government!" They wrecked the tax stalls, kept moving, and destroyed the nearby home of an infamous tax collector by the name of Girolamo Letizia. With a mob/army of, by now, tens of thousands on the loose and roaming the streets, the Spanish viceroy was forced into concessions that, on paper, seem modest enough: the repeal of unjust taxes and the re-institution of some of the early reforms set up in the previous century by the great founder of the Spanish Empire, Charles V. There was no realistic expectation or demand in 1647 for the abolition of the monarchy, a constitution, or even, what some say Masaniello (probably Genoino, above) really wanted: a reordering of society by which the people and the noble classes would be declared "equal"—whatever that might have meant. Masaniello got his few concessions, but they were apparently a rearguard action while the viceroy regrouped his forces. In other words, the viceroy caved in quickly, wined and dined Masaniello and his wife, and then set about getting rid of Masaniello. Simple murder makes martyrs, so that was out of the question. Somehow he had to make Masaniello irrelevant, disengage him from his cause and his followers. A few days into the revolt, Masaniello started exhibiting strange behavior. He went mad, they say. There are two possibilities: one is that he was totally drunk with the trappings of power conceded to him by the viceroy—by the parades, the banquets, the white horses, by having himself appointed Captain of the People, by hearing his wife referred to as "the Queen of the People", etc. etc. Two—by most accounts, a likely possibility—is that he was poisoned with roserpina, a powerful hallucinogenic, dumped into his wine at one of the many banquets he attended at the palace. On July 16, after giving a rambling, incoherent declaration to the people, he stormed into the Church of the Carmine and disrobed. At that point, obviously helpless and useless, he was dragged into a room in the adjacent monastery and murdered, probably by hired assassins. They severed his head and took it to the viceroy. The rest of Masaniello was collected by his loyal followers, who managed to get the head back and give the entire body a decent burial in the Church of the Carmine. More than a century later, these remains were disinterred and disposed of (probably strewn into the sea) on the order of Ferdinand IV of Naples, who was taking no chances that the burial site might serve as some sort of a pilgrimage point for yet more revolutionaries. The revolt lasted nine days, start to finish. At its headiest, it made the viceroy desert the palace and hole up in the Castel dell'Ovo for a while. At Masaniello's death, the revolt was spent, and it is difficult to judge whatever potential it might have had in the hands of a solid block of organized revolutionaries. It did set the stage for a very short-lived First Neapolitan Republic as part of the struggle for Naples between Spain and France. 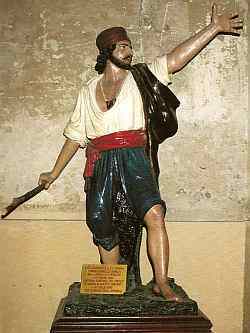 Masaniello was no doubt a natural rallier of men. They say that he and his rebels refused bribes from the Spanish to calm down, and that they even turned down an offer of help from the French, who would have been happy to see the Spanish lose Naples, land that had once been French. Be all that as it may, no constitution was granted or even demanded. Masaniello wanted a redress of grievances, which he got, and which did not last long after his demise. States are not toppled by charisma alone. They may be toppled by charismatic leaders with a power base, something that Masaniello lacked. There is no evidence that the rebellion, itself, produced any lasting effects on the social conditions of Naples or on the generally miserable lives that the masses led. The episode, perhaps, served to remind the rulers that the masses could get out of hand. It is not clear that the rulers stored that bit of knowledge in any but the most peripheral parts of their consciousness. It would be 150 years before Naples was swept by other waves of revolutionary fervor, this time more solid ones coming in the wake of the French Revolution and Napoleon Bonaparte.